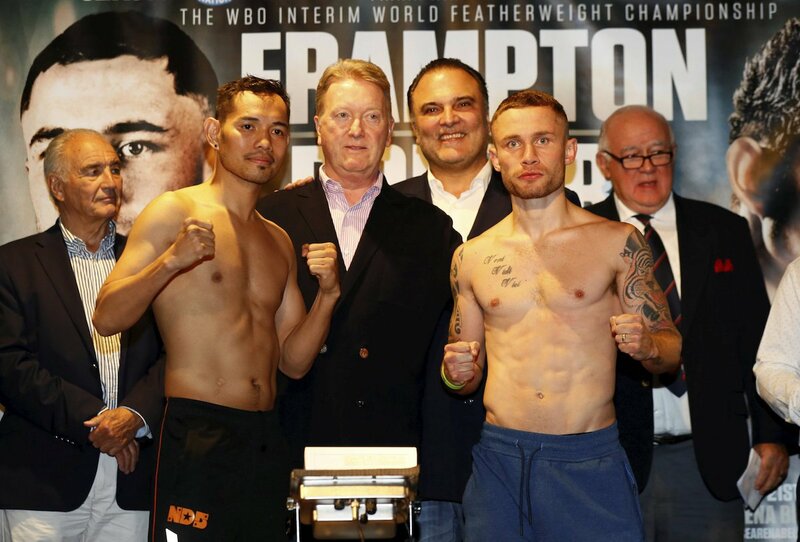 Former world champions Carl Frampton and Nonito Donaire made weight ahead of their clash for the interim WBO Featherweight Title this Saturday, April 21. The main event bout from SSE Arena in Belfast will stream live to U.S. audiences via SHOWTIME Sports YouTube Channel and SHOWTIME Boxing Facebook Page or here on ESB. The SHOWTIME BOXING INTERNATIONAL® livestream will begin at 5:15 p.m. ET/2:15 p.m. PT with coverage provided by BT Sport and BoxNation and featuring commentary by U.K. sportscasters John Rawling (blow-by-blow) and former featherweight world champion Barry Jones (analysis). Carl Frampton was full of sound and fury at the weigh-in for Saturday’s colossal clash with five-weight world champion Nonito Donaire in Belfast. ‘The Jackal’ looked sensational on the scales as he clocked 8st 13lb 3oz and then seized another opportunity to shine when a microphone malfunctioned. Shouting out the reading to the crowd himself, the hundreds who had packed the Europa Hotel’s ballroom roared back. Donaire was also comfortably inside the featherweight limit at 8st 13.5lb but despite the Filipino ingratiating himself to the locals at Thursday’s public workout, the time for light-hearted hospitality is giving way to gravitas. While retaining graciousness and voicing his respect for Donaire’s illustrious achievements at every opportunity, Frampton has exuded a calm seriousness all week as he prepares to secure another world title shot with a career-best performance. There were words between the rivals in one of the undercard’s standout fights as super-lightweights Tyrone McKenna and Anto Upton exchanged pleasantries. All MTK Global fighters were successful in making their weigh-in targets as McKenna, Upton, Conrad Cummings, Luke Keeler, David Oliver Joyce, Lewis Crocker, Steven Ward, Sam Maxwell, Marco McCullough, Tyrone McCullagh, Troy Williamson and Alex Dickinson clocked in.